Mix venison, pork, rice, garlic, onion, salts, pepper, and eggs in bowl. Cut of the tops of the peppers and set aside. Clean out seeds carefully. 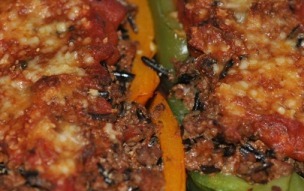 Stuff meat mixture into peppers and replace tops. Place in a Dutch oven and add tomato sauce and bay leaf. Cover and bring to a boil. Simmer on low for about 1 hour. Add water as necessary if liquid gets low. Remove and serve hot. Serves 5 to 6.